Little more bubbles testing going on. Tried to render the bubbles alone to see the effect. Also tried another render with a different index of refraction. I’m having trouble with certain aspects of the shader. In the second image there are nice bubbles going on and the volumetric effects are really cool. Also the robot is receiving shadows from the bubbles, however the actual water geometry looks really fake. Also I received feedback of the water being too dark and adjusted it, but that changed the entire dynamic of the water. In my next post I’ll elaborate more. Been busy last week determining the look and feel of the water in the test setup. I tested some different indexes of refraction because of the visibility of the robot. 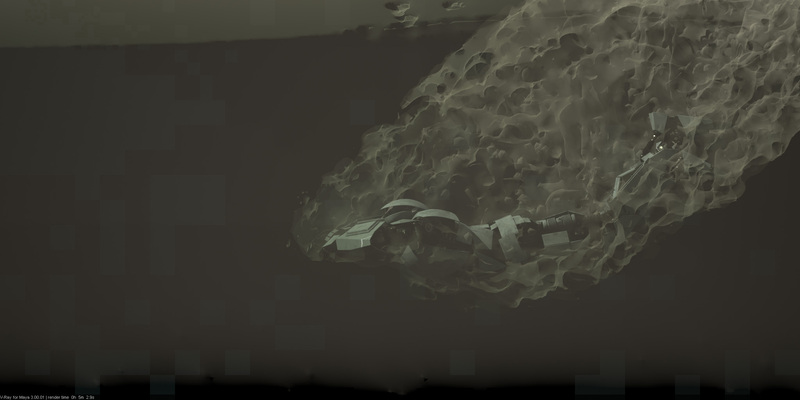 The robot needs to be clear in the picture when making the dive. The mesh can also handle a velocity pass! It looks pretty! First time bubbles! The bubbles are simple V-Ray shaded particles. The water is also a V-Ray shader with fog for volumentric effect. 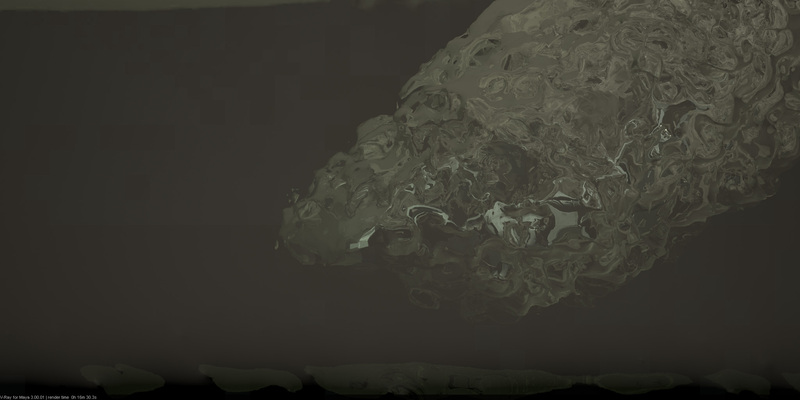 Imported the mesh from Realflow and applied a V-Ray shader to it, the shader uses fog to get the diffused underwater effect. Nothing has been composited, this the shader & fog doing all the work. Bubbles are going to be added. 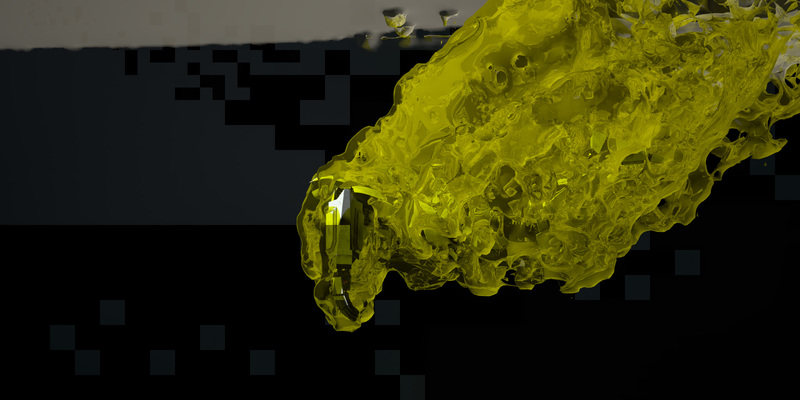 However, when I shuffle through my render elements (GI, Reflect, Refract, etc.) most of them are completely black. Also the the alpha is completely white. I still want to give the compositers a lot of control for this shot so that means that in it’s current state the footage looks good, but is hard to composit. We have to find a workaround to get the render elements under control. More to come. 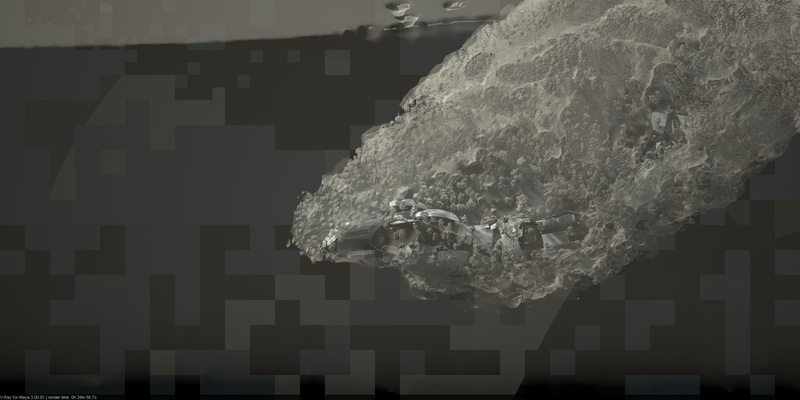 I’ve done some render tests on how the robot is going to look under water. 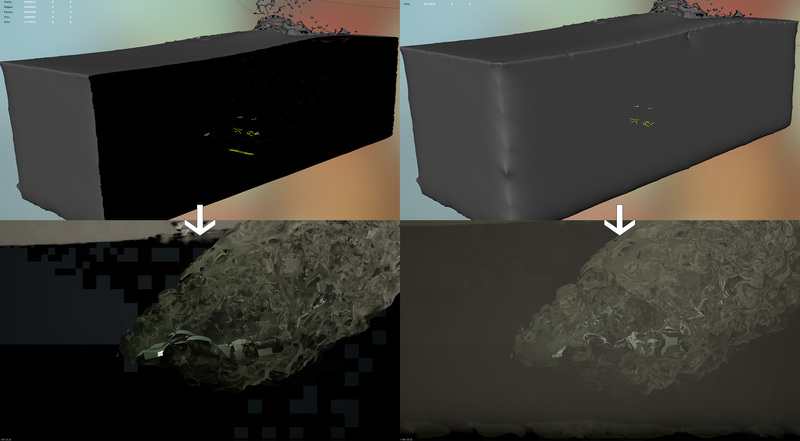 I imported the generated mesh from Realflow and applied a V-Ray shader to the mesh. All images are direct outputs from V-Ray. In the first image I wanted to test the outcome of the water, it pretty much needed a water feeling. In the second image I wanted to achieve the underwater look and feel. Since he is not jumping in water in Bali the water has to be a bit dirty. The water in Rotterdam harbor probably is dirty and sand kicks up because of the natural ocean movement but also from ships passing by and the harbor being only around 23 meters deep (source here) sand would be kicking up. Ivaylo told me to use a bit of fog to get the volumetric light going on, which I had expected to use. However I added too much green and now the robot jumps into a toxic pool of doom. In the third image I got closer to the result I am looking for. However I didn’t get the foggyness I was looking for. Also the left elbow of the robot was sticking out and becoming obviously white. In the fourth image I got the result I wanted. The dirtyness of the water is present, the bubbles look good and I got rid of the robots elbow being white. In the last image you can see what the difference is between the previous two images. 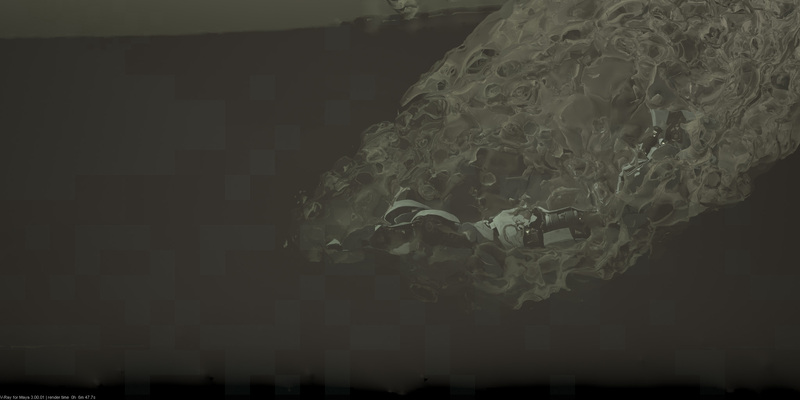 In the first comparison where the robot’s elbow is visible you can see that the water mesh is open on one side. This means that the camera is looking directly at the robot’s elbow so of course it is going to be white. 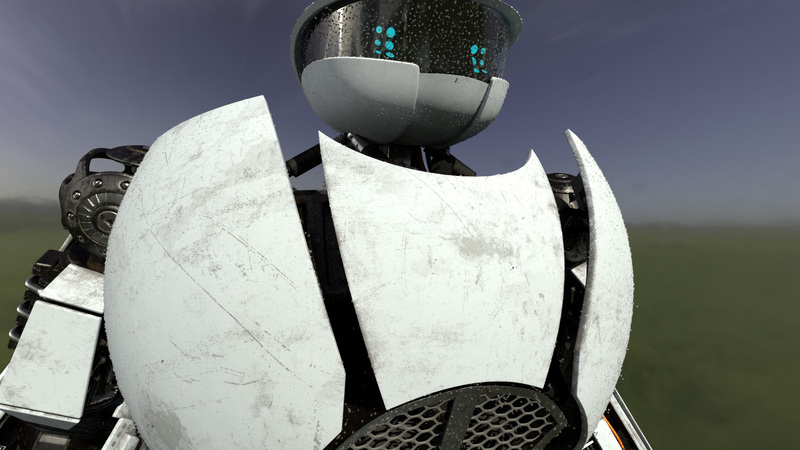 In the second comparison you can see that the water mesh is complete and not clipped, this means that there is now a shader in between the camera and the robot’s elbow. So the problem solves, also it amplifies the look and feel of the fog, which is what I wanted to achieve. The robot is correctly interacting with the fluid now and it looks really cool. I wanted to see how much bubbles I got and messed around with the bubble emission rate. The problem with the robot not interacting with the particles was that i linked the group directly to the Hybrido Domain. So I linked every individual object to the hybrido domain which seems to work. The problem now is that the bubbles don’t really seem bubbles, they are not quite floating upwards yet. This has to do with the speed of the animation, the bubbles don’t have any chance to become buoyant since they still have a downward force from the robot. Since this is just a test setup Hajir animated the robot quick and dirty so for future reference we need a slower robot. Also this shot will be a slow motion shot! So that means we will work with 48 frames per second. 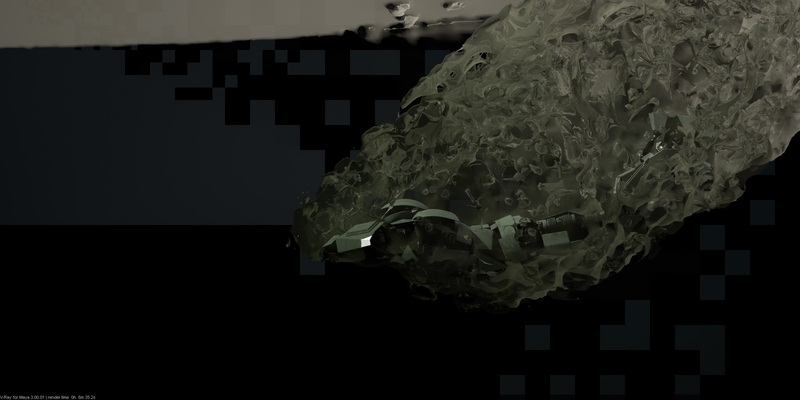 I’m working on a new scene where the robot is diving into the sea. 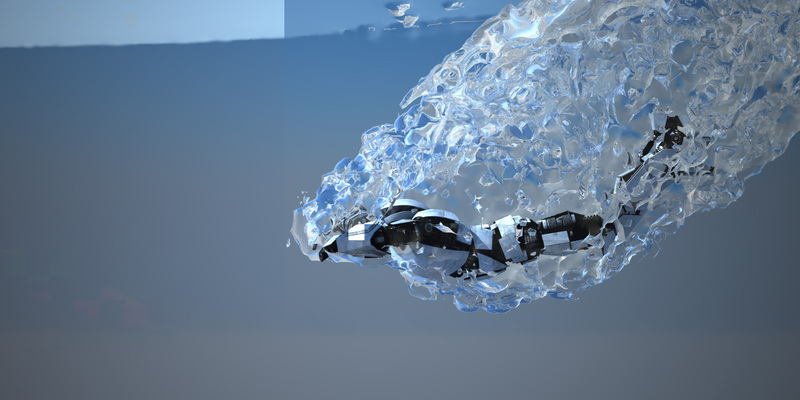 In this scene we want to get a lot of bubbles coming from the robot when he hits the water. This can be achieved by using hybrido and the bubbles emitter. 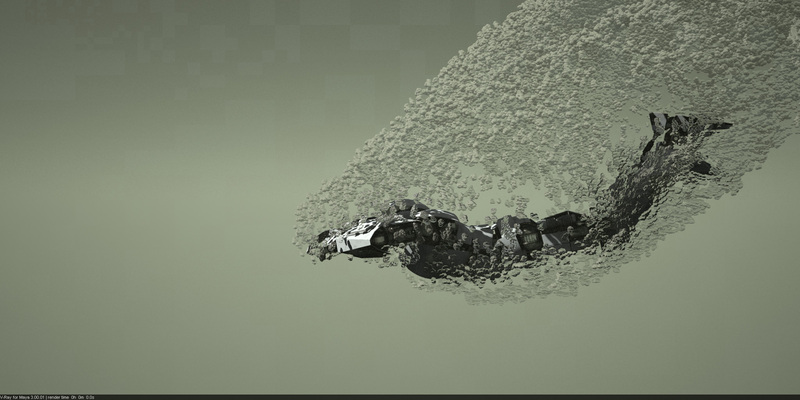 Realflow calculates the hybrido fluids first and then on top of that the bubbles emitter will kick in. 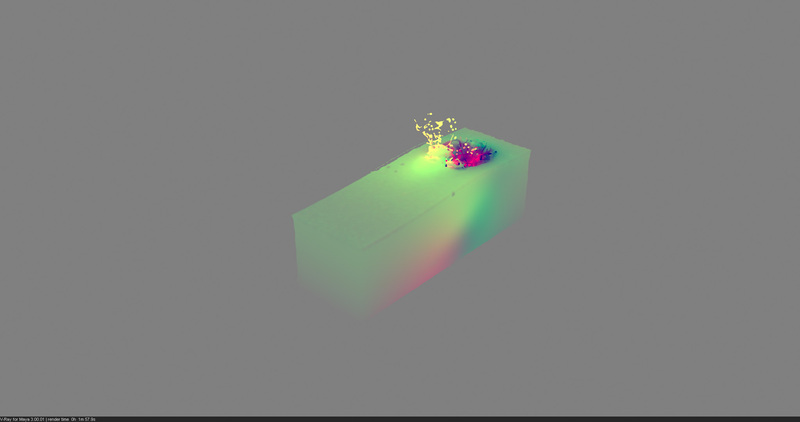 In this test the robot did not interact correctly with the fluid in this sim. I hooked the group of the robot to a HUB but it didn’t work out. 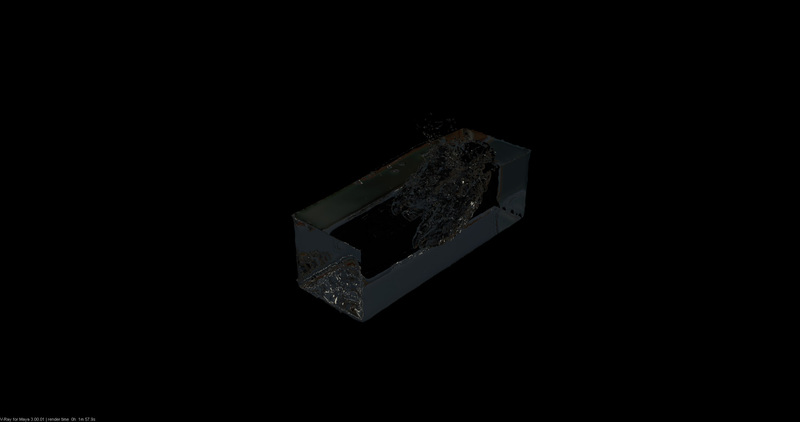 Also the gravity is affecting the water and the particles are crashing down into its container. On to the next test. 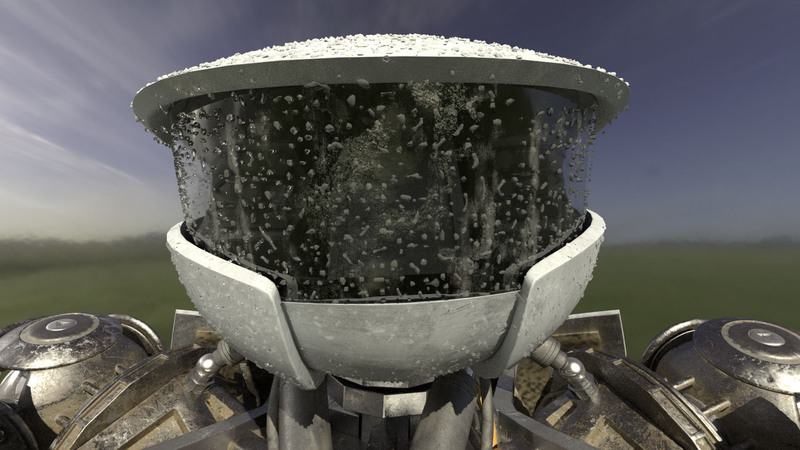 Last week I had done some renders with the robot up close and with the helmet only affected by droplets. I decided to see how it would look like from a distance because the robot won’t be that close in the shots that need water dripping of the robot. In general I’m happy but also quite surprised with the outcome, because the droplets have to be so tiny (since the robot is huge) you can’t really see them. I know that the droplets are there to be added as extra, but I’m kind of disappointed you can’t see much of it on it’s armor. Water on white will never really be obvious because of the transparency of the water and white background which makes it hard to distinguish the difference. However, on black it works a lot better. On it’s visor the water droplets are much more obvious. On this part of the robot I’m really satisfied with the result. I am currently making a video of the water droplets to see what’s happening in motion to the droplets. I’m going to post it next week. 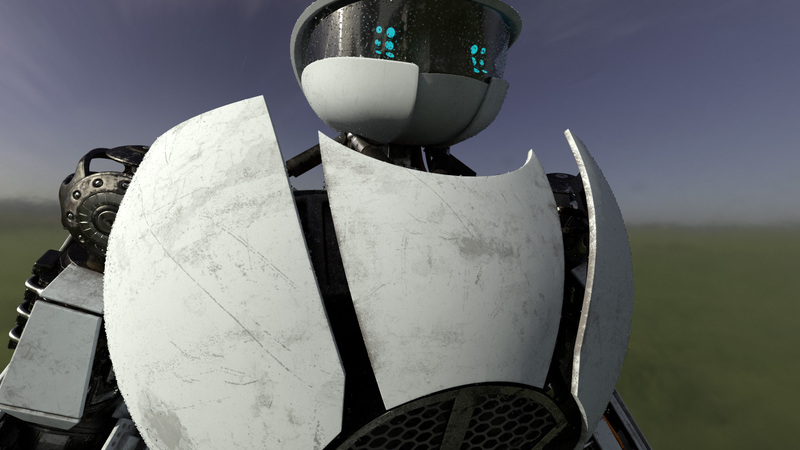 Render 1: Robot in sRGB workflow. Render 2: Robot in linear workflow. Render 3: Robot in linear workflow with correct index of refraction in the water shader (1.52). Render 4: Robot in linear workflow with correct index of refraction in the water shader (1.52) and changed sun position for effect. So I’ve made new sims with the high poly robot and the water looks awesome on top of the geometry of the robot. I’ve made a render with the eyes lit and unlit. I am really happy with the result, I think that the robot actually looks like it has been submerged. A little feedback from the guys was that the drops have to be smaller. This is possible but smaller than this will probably make the droplets disappear when the camera is at a distance. I still have to test this out, I am now covering the robot’s chest in droplets so I can see what the result is from a distance. Considering the 1.30 meters in width and 0.84 meters in height of the robot’s helm the droplets should be smaller, we’ll see. One little thing i still have to adjust is the water shader, it is not exactly behaving the way I want to but this is of course the last step in this process. I might post some renders later this week, but it will be with the sun in a different position and updated water shader. If you look at the water shader as it is right now, you can see directly from the front that the water seems to be photoshopped in there. 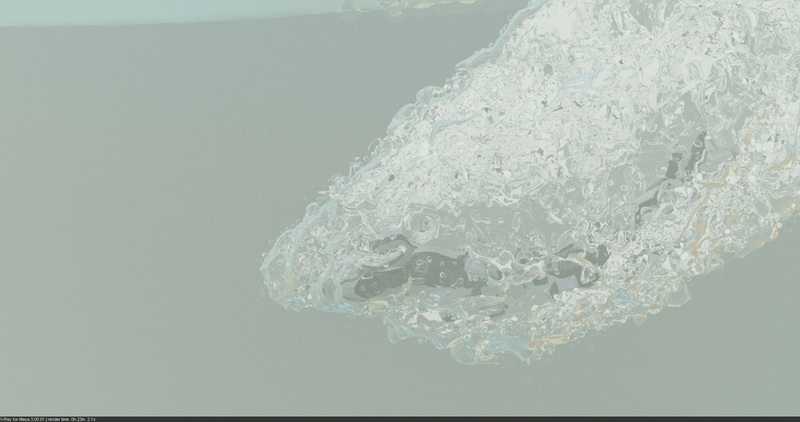 The water from the side however seems more realistic and even has awesome caustics going on. The water on top of the helm looks okay, but still not where i want it to be. However the water on the side of the visor is very awesome in my opinion and seem to have the best result in this image. Also the caustics interacting with the blue eyes is cool! Mind you that only the head is being worked on right now, so you can ignore the body.